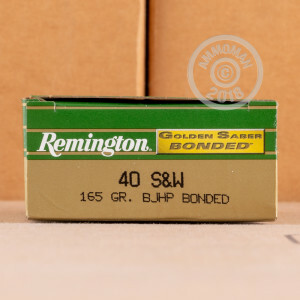 This Remington Golden Saber ammunition in .40 S&W delivers superior penetration thanks to its hard brass jacket. 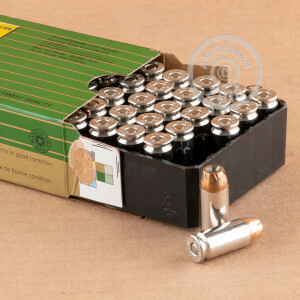 Each cartridge fires a light 165 grain hollow point projectile at an above-average muzzle velocity of 1,150 feet per second, producing excellent terminal ballistics to incapacitate a threat quickly. These cartridges come in convenient 50 round boxes and use non-corrosive Boxer primers and nickel-plated brass cases ideal for the rigors of daily carry. 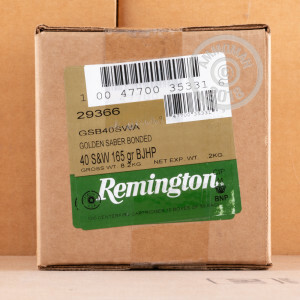 Pick up a few of these boxes of affordable self-defense ammo and train with your carry load! Place an order for $99 or more at AmmoMan.com to get free shipping.